NEW YORK (CNNMoney) -- AT&T handily beat Verizon in the battle for iPhone customers last quarter, but the company lost $6.7 billion in large part due to its failed merger with T-Mobile. The nation's second-largest wireless company said Thursday that it sold 7.6 million iPhones during the holiday quarter, which bested arch rival Verizon's (VZ, Fortune 500) 4.2 million. Despite the fact that Apple's (AAPL, Fortune 500) iPhone has been available on multiple carriers for almost a year, AT&T (T, Fortune 500) has continued to outpace its rivals every quarter. Sprint Nextel (S, Fortune 500), which began to sell the iPhone last quarter, will report its sales figures on Feb. 8. Verizon Wireless had a very good quarter, adding 1.2 million new customers under contract. AT&T added only 717,000. But AT&T bested its competitor for the most lucrative customers in the high-end smartphone market by a sizable margin. AT&T sold a stunning 9.4 million smartphones in the quarter, 50% above its previous quarterly record and more than the 7.7 million sold by Verizon. About 82% of AT&T's phones sold last quarter to customers with two-year contracts were smartphones, higher than the 70% Verizon sold to its contracted customers. As a result, 57% of AT&T's wireless customers under contract are now smartphone customers, compared to 44% for Verizon. AT&T's average revenue per user was $63.76, much higher than Verizon's $53.14. But the flip side of that success is that, like Verizon, all that smartphone growth is coming at a steep cost. Both companies pay heavy up-front subsidies to manufacturers to bring the cost of smartphones down to roughly $200. Sprint for instance, recently said it expects to lose money on the iPhone until 2015. AT&T's wireless service profit margin was squeezed to 38% -- down from almost 41% a year ago. Verizon performed only slightly better with a 42% wireless service margin. Shares of AT&T fell 2% on Thursday. To address the issue, AT&T recently raised rates on its smartphone and tablet service by about $5 per month. 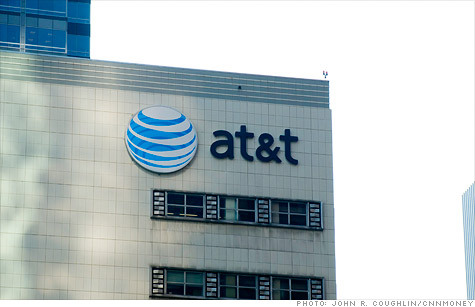 0:00 / 2:02 Who wins in AT&amp;T-T-Mobile deal breakup? AT&T said it is also looking for cost savings elsewhere. For instance, it is continuing to deploy its more efficient 4G-LTE network, which the company said can add between 30% and 40% more capacity than 3G. But the wireless giant said it continues to lobby the government to free up wireless spectrum, which it says is key to making its network more efficient. "LTE is not the silver bullet," said Randall Stephenson, AT&T's CEO, on a conference call with analysts. "We continue to advocate for more open options to come as soon as possible." Last year, AT&T attempted to buy T-Mobile for $39 billion in order to acquire more spectrum. But that deal failed to gain the government's approval due to antitrust concerns. So AT&T was forced to pay T-Mobile's parent company a break-up fee of $4 billion last quarter. AT&T also incurred separate, one-time losses from its benefit plan and investments. Combined, AT&T lost $6.7 billion in the quarter, compared to a $1.1 billion gain a year earlier. Excluding those one-time items, AT&T earned 42 cents per share, just shy of the 43 cents forecast by analysts surveyed by Thomson Reuters. Sales grew 4% to $32.5 billion, higher than the $32 billion expected by Wall Street analysts.